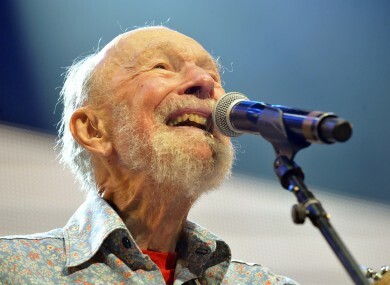 US FOLK SINGER Pete Seeger, famous for his strong lyrics and political activism, has died at the age of 94. Seeger, who died of natural causes at New York-Presbyterian Hospital last night one week after being hospitalised, spent his life as a champion of folk music. He was known for his renditions of songs like “If I Had a Hammer” and “Where Have All the Flowers Gone”, which he co-wrote, as well his version of the civil rights hymn “We Shall Overcome”. Seeger, who played the guitar and the banjo, was an iconic figure in folk music. He was involved in many political causes, from anti-Nazi protests in the 1940s to the civil rights movement in the 1960s to the Occupy movement in the 2010s, and was vocal about his beliefs. He was one of the key figures in the revival of folk music in the US in the late 1940s. He was kept off television for more than one decade after he was investigated by the House Un-American Activities Committee in 1955 who questioned him about his former membership of the Communist Party and charged him with contempt of Congress. However he later described the 1950s as the highpoint of his career, as he toured America spreading the music that he had created or preserved. “The most important job I did was go from college to college to college to college, one after the other, usually small ones,” he said in 2006. “…And I showed the kids there’s a lot of great music in this country [the US] they never played on the radio”. Seeger had the words ‘This machine surrounds hate and forces it to surrender’ inscribed on his banjo. “Be wary of great leaders,” he said in 2011 after an Occupy protest in New York. “Hope that there are many, many small leaders”. He married his wife Toshi in 1943 and the two were together until her death last year. Email “Folk legend Pete Seeger dies at 94”. Feedback on “Folk legend Pete Seeger dies at 94”.